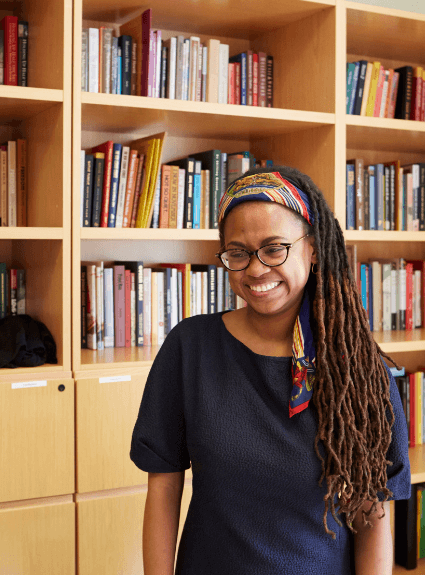 Jamia Wilson is the executive director and publisher of Feminist Press at City University of New York, an activist, feminist, storyteller, and a mediamaker. The Feminist Press is the longest-running feminist publisher in the world. We like to say that we've been lit since 1970. We have been publishing books that other publishers might deem too risky, too controversial, and downright too feminist, for almost 50 years. Our lens is unapologetic and stigma smashing, and the kinds of conversations that we’re elevating, and the way in which we elevate them, is very special. Feminist Press started with intersectional works, the first black feminist anthology was produced by the Feminist Press, But Some of Us are Brave. We talk about feminisms a lot here—we know that there are many different ways in which people approach feminism. At Feminist Press, we hope that we embody many feminisms, and we have books that will be in conversation, and disagree with each other. There are feminists who will put their bodies on the line in direct action activism. There are feminists who will put their money on the line who have the access to do that through funding philanthropic works or investing in other women's businesses. There are feminists who are activists because they will use their voices on their platform to elevate their voices and elevate other people's voices who wouldn't otherwise be heard. There are feminists who feel like they want to sign petitions or quietly make the decisions that they make in their life in a way that is geared toward gender justice, and all of those are okay. All of those are righteous. We are in a position to maintain the integrity of feminist publishing, in a moment where feminism is “hashtag trending,” to make sure that we’re staying in line with the true values of feminism and also elevating the voices of the most marginalized and underrepresented in this industry. We have existed much longer than our founder thought we would need to exist because the world has not gotten to a point yet where we’re liberated from systems that oppress us. I often wondered if the founder of Feminist Press had been a woman of color, she would have known that we still needed to exist because of the nature of how systems of oppression work, how you learn early on how insidious those things are, and how those long term effects are on a community. We’re still working to shift the paradigm, and to own narrative power for people of all genders and all races. It's been exciting to be at the helm of this organization as the first woman of color and the youngest person in 47 years. As we look toward the 50th [anniversary], we’re thinking about how to deepen and strengthen the values that we already have in intersectional work and global feminisms, and elevating debut authors with underrepresented voices and centering them. One of the reasons I came to the Feminist Press, in the aftermath of the 2016, or I call it 11 9 2016, I did feel that it was important to be at a site of feminist movement building and storytelling—shaping the direction this country, quite possibly the world, for the next hundred years or more. I wanted to be the part of our next story for that reason, but also learn from feminists who came before me. Not that long ago, my ancestors were forbidden from reading because people knew that knowledge was powerful—having that ancestral epigenetic insight has been very helpful to me. It helps me in terms of empathy. When I think about what are the books we are prioritizing, who are the groups that I want to publish, to help elevate those voices because I know what it's like to be silenced and to be intimidated and harassed simply for being who I am, simply for wanting the dignity of self-expression. I don't have kids yet, but I’ve said that if I have kids what I really would want to tell about this time is that mommy did her best to make things better. I didn't sit silently and watch the world stay on fire, I tried to be the water to help the garden grow, in the midst of the scorched earth. My parents did that for me, my late mother was a Civil Rights activist, sacrificed a great deal because of it, and I’ve seen the fruits of that in my life—so that's another reason I personally find myself here. I want to be able to look my future children in the eye or the kids that I love in my family, and say I didn't just stand there and live complicitly. I tried to fight for a better world for you. It's really painful when you realize that your story, in its beauty, its importance, its complication, might be so terrifying for others who need you to stay in your place, in order to maintain their power and dominion. There is such fear about what does it look like when we raise our stories collectively. Sometimes there's a push for people to be really individualistic or to say, “Don't be aligned with those ‘bad girl feminists’ that we warned you about. You need to focus on you, and we will prop you up and give you these privileges, if you eschew the collective.” At the end of the day that doesn't guarantee freedom, and we’ve seen this many times in different examples that I can cite around what is dangled in front of people but it's really because they understand that our voices are powerful. Each of our voices is powerful, but when we put them together it becomes a megaphone of power and can have seismic reverberations. Being in my 30s now, one of the things I'm very self-conscious about is I don't have children, and I often have people just assume that it's because I can’t. But, I’m trying to figure out if children align with what I’m doing, and I’ve been called to do these other things. I know in my heart the roles that I want on my obituary: I want author, activist, something about global impact, I could live with it not having mother. It almost feels like we have a societal stigma about even saying that sentence. Now, I'm saying that my books are my babies, and my adopted babies are these other books that I help other people produce. Maybe there will be a child who will choose me to be its mother at some point in life, but I feel that author, activist, those are two things that when the story of my life ends that is what I want to have told in my story. My new book is called Step into Your Power: 23 Lessons on How to Live Your Best Life. It follows my first book, Young, Gifted and Black. It was really important to me and the amazing illustrator Andrea Pippens, to show change makers and prominent figures from a global perspective. We wanted to show how the experiences of them as children impacted the kind of change that they made in the world. This second book came from the fact that we received questions from people saying, okay now that I've learned about these great figures, what can I achieve as a young person? I thought about lessons I had learned in my life, many of them from my mother, and really just kind of thought about what would kids between eight and 14 need to learn about stepping into their power? What kind of interactive exercises could they do to help them have those experiences every day? And so, everything from: How do you deal with bullies? How do you come back and find the lesson from what feels like a failure? How do you deal with illness—your own or someone you love? How do you take action on an issue that you care about in your community? Because Andrea and I are both only children who always wanted a big sister, the book is kind of written from the voice of a big sister figure, so that anyone can have a big sister, and this book will help them feel powerful. There's always been a connection between self-expression and fashion, and connection between the iconography of what's seen as the mode in fashion during a time and situating movements within it. With the Dior show, highlighting the “Sisterhood is Global?” t-shirt line and in homage to the books by Robin Morgan. I think about how much fashion is also a response to what's happening in movements, and about the designers that I am inspired by and how they are also connected to movements, and using the platforms that they have to elevate consciousness. I think about that with my own decisions about what clothing I wear. I think about the ethics of sustainability, what are their labor practices, but I also think about, are these designers feminists? I really love Mara Hoffman, Lingua Franca, their sweaters, I love the work that they're doing, the work that they support, and the women that they're uplifting. Eileen Fisher, who’s a designer who I have partnered with, Tracy Reese, a designer who also showed me the power of black designers being worn by the figures of our time and uplifting that work. Right now, I'm reading a lot of manuscripts here at Feminist Press. I’m reading a manuscript called Parenting for Liberation, by Trina Greenbrown. It was a book that she self-published that we are re-issuing, with the Feminist Press, about raising liberated black children. Most recently, I have returned to a book I had already read, but I’m reading it again because I needed it to kind of affirm my own power right now, which is Eloquent Rage by Brittney Cooper, who has been a Feminist Press author through our The Crunk Feminist Collection book. It is a book that makes me feel so seen, so connected, so tied to source and strength, and I revisit it when I think I'm in a time of another shift in my life and I am becoming more powerful and becoming more rooted. I believe that we will need to be in existence for as long as my lifetime and beyond that, based on where we are systemically. The kind of feminisms that we are practicing and experiencing here are not something that systems within certain for-profit presses would be able to sustain. We have a democratic submissions process where every manuscript that is submitted to us is reviewed and read. The gatekeeping traditionally done at some of the bigger publishers, is not done that way here, because of our feminist values. We can create solutions in the storytelling, giving a new story of power in the form of our books, in the form of the objects that we produce. Thinking about what's going on with technology right now, and how everyone's talking about what are the ethics around having a select few controlling what we're accessing on the interwebs, right? But this (knocking in the book), is an object, this is something you can carry to the rally with you. This is something that cannot be algorithmically corrupted to keep you from getting the information you need and so, it has new meaning in terms of why I feel that it's important to be here at this moment.